It never rains but it pours. Bad things happen in groups, not in isolation. Misfortune compounded on top of further misfortune. A wasp flying into the face of someone who’s already been through enough that they’re crying. Some sources connect the puffiness of face that comes from crying hard to the swelling of a bee or wasp sting; others merely discuss the compounding of bad luck. We begin with the verb 泣く (naku), “to cry,” in prenominal form (連体形). Naturally, this is prefixed to the noun 面 (tsura), “face.” This is marked by the directional/positional particle に (ni), and finally the noun 蜂 (hachi), “bee” or “wasp.” The final verb is elided or assumed, and thus the exact function of に is not precisely pinned down; this doesn’t present any obstacle to understanding, though. Some versions add an emphatic sound shift, changing 泣き面 to 泣きっ面 (nakittsura). This saying is the な entry in the Edo Iroha karuta set. 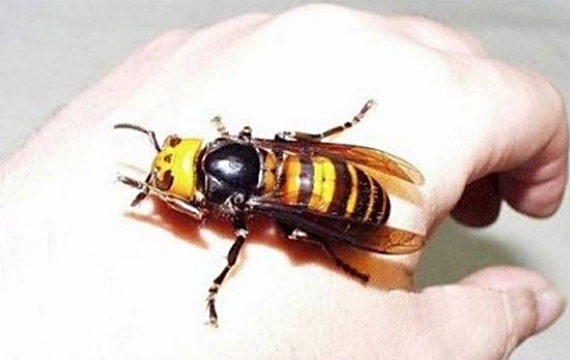 Japan is home to some truly terrifying wasps. This entry was posted in Japanese, Kotowaza and tagged 蜂, hornet, Japanese Giant Hornet, misfortune, wasp, 泣き面. Bookmark the permalink.